Rain and thunderstorms (isolated severe weather & thunderstorms) to develop from the Ohio Valley into the South into midweek. Flooding is also possible across the Ohio Valley. At least 3 inches of rain will likely soak an area from the mid-Mississippi Valley into the Ohio Valley, with localized totals of up to 5 inches possible. The heaviest rain will occur where any rain or thunderstorms persist – or “train” – over one location for several hours at a time. 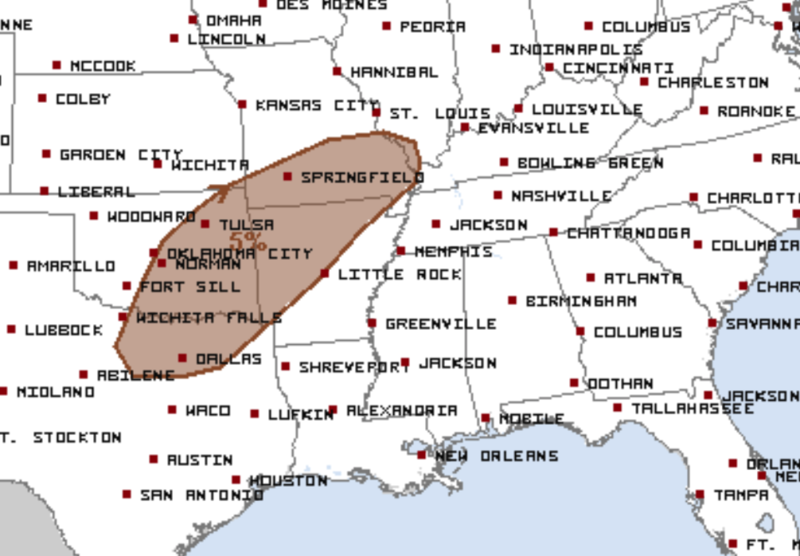 The chance of isolated severe thunderstorms may first develop Wednesday afternoon or overnight from northeastern Texas and eastern Oklahoma to northern and western Arkansas and southern Missouri. Large hail and damaging wind gusts are the primary threats. Southerly low-level flow ushering increasing boundary-layer moisture will promote destabilization despite widespread cloud cover for much of the day. Model guidance indicates surface dewpoints will range from the lower 60s over the MO Ozarks into the low-mid 60s farther south and southwest over southeastern OK/northeast TX. The EC appears to more realistically depict the timing of the surface low evolution compared to a quicker-GFS solution and slower NAM. Scattered showers and thunderstorms are possible during the day from the Ozarks northeastward into the OH Valley in association with warm advection. It is uncertain whether diurnal storm development will occur over the southern Plains prior to increased forcing for ascent arriving after dark. Nonetheless, stronger thunderstorm development will likely focus farther west beginning as early as the late afternoon but likely delayed until after dark, near the west edge of the returning moisture from central OK into TX. Adequate mid-level lapse rates may support some hail potential with the strongest updrafts early in the convective lifecycle. Greater conditional potential for severe may evolve with a convective band growing upscale during the evening into the overnight from near the MO/AR/OK border south-southwestward with severe gusts possible. If a mature squall line develops, the strong shear may support some risk for a short-lived, boundary-layer mesovortex or two in an otherwise marginally buoyant setup as it moves through eastern OK into western AR late.